Just a quick post as I’m in between projects & more projects (seems like there’s never enough time in the weekend, right?). The weekend was stupendously beautiful but I spent most of it inside cleaning and organizing and working on design projects for my business (more to come later this month, hopefully!) and for the class I’m taking (an Adobe InDesign class). Mostly fun projects, but, nonetheless, projects that left me with little time to cook or work in the garden as hoped. Part of the quick cooking (G was also working on half of the kitchen–tearing out wallpaper, dealing with the half-inch of glue on the walls) was improvising with a 1 foot square counter space and stove/oven. Turns out it’s not so hard to work in such a small space–I know, I know, New Yorkers are shaking their heads at me as I type–and cabbage is always your friend. Not only is cabbage cheap and filling, but it’s also loaded with fiber, vitamin C, & vitamin K (not to mention super low on the glycemic index). As a way to highlight the versatile vegetable, I served it as a simple warm slaw with apples, mixed berries, and toasted pepitas. 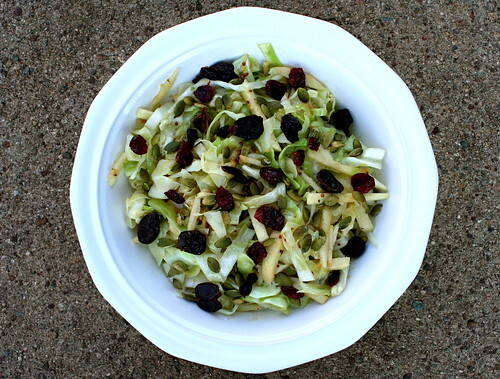 The tangy, whole grain mustard dressing plays nicely with the crunch of the cabbage and the apples add a fresh sweetness with the berries. Perfect as a side to veggie burgers or at a Thanksgiving dinner, the slaw is easy to prepare and only needs a few minutes to cook. Not only that, it’s tiny kitchen friendly. Feel free to substitute pears for the apples, any kind of dried fruit for the berries, and whatever crunchy nuts or seeds you like for the pepitas. It’s a canvas for your own favorites, and it’s great dish to win over the no-cabbage people in your family! Place the mixed berries in a small bowl. Fill with hot water to cover. Set aside. In a large skillet/dutch oven, warm the olive oil over medium heat. Add the cabbage and stir to coat. Saute the cabbage until slightly wilted and warmed through (3-4 minutes). Season with salt & black pepper to taste. Add the shredded apple and stir to combine. Set aside. While the cabbage is cooking, add the pepitas to a dry skilled and toast over medium heat, stirring constantly so as not to burn, for 3-4 minutes. As soon as the pepitas begin to brown, remove from heat, put in a cool bowl and set aside. To make the dressing, whisk the mustard, vinegar, and maple syrup together. Slowly drizzle in the olive oil, whisking constantly, to emulsify. 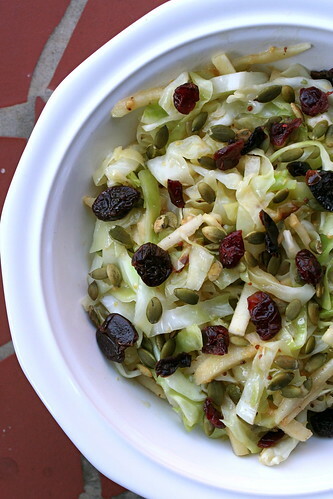 Place the cabbage mixture in a large bowl and add the dressing. Mix to coat thoroughly. Drain the water from the berries and squeeze dry. Add the slaw, along with the pepitas, and serve. Yes, hooray for cabbage! And the apple combination is classic & wonderful. I actually just had a plate of leftovers full of shredded purple cabbage too. Yay! Ooh yum! I have most of these ingredients in the kitchen right now, too! The joy of seasonal cooking.